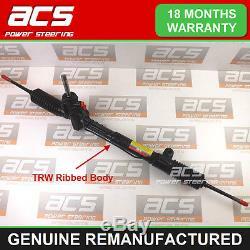 Vauxhall Zafira A Power Steering Rack to fit models.. TRW Type, With Ribbed Body (See Image 2). 02.1998 > 12.2004. Please Note: This will only fit models with the. 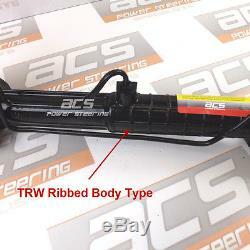 Please see our other listings if you require TRW Smooth Body or Delphi Type. We will collect your old unit FREE of charge from UK mainland Excludes Postcodes (BT, AB, LA, CA, TR, IV, HS, KA, KW, PA, PH, ZE). Postcodes (AB, BT, CA, IV, HS, KA, KW, LA, PA, PH, TR, ZE) may incur an additional cost. We dispatch all items on a 24 hour courier. Any items dispatched on a friday will usually be received on the following monday. Please contact our sales team. Postal Order - Made payable to "ACS Midlands Ltd". Cash - Cash on collection. The item "VAUXHALL ZAFIRA MK1 POWER STEERING RACK 1999 TO 2005 -RECONDITIONED (TRW Ribbed)" is in sale since Friday, January 04, 2013. This item is in the category "Vehicle Parts & Accessories\Car Parts\Suspension & Steering\Steering Racks & Boxes". The seller is "autobitz2007" and is located in Tamworth.